THE CATS ARE OUT OF THE BAG. 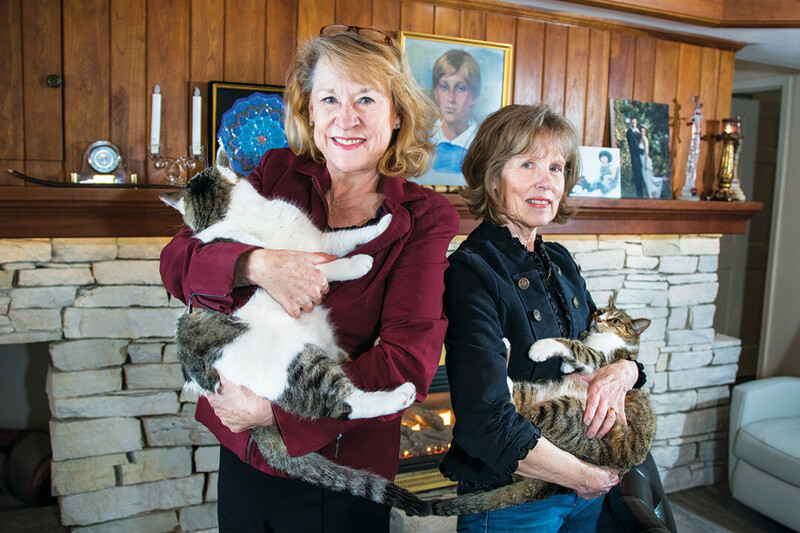 Best friends of 40 years Jayne Fleming and Betsy Gerdes have partnered on a new book called Magic in the Leaves. It happens in the brittle snap of fiery autumn leaves, the glistening kiss of winter’s first blanket of snow, or the warm chuckles of forever friends. Magic happens in small ways, and best friends of 40 years Jayne Fleming and Betsy Gerdes partnered together to bring a little bit of that magic into children’s lives with their new book, Magic in the Leaves. “I had the story rolling around in my head for quite a while,” Fleming said. “I thought it would be so fun to turn it into a book.” Magic in the Leaves tells the story of a clever young boy, Adrian, who visits his grammy and grandpa’s farm in Wisconsin. One autumn afternoon, Adrian’s grandpa tells him about a fun and exciting game he can play in the yard ... raking the leaves. While raking the yard, the simple piles of leaves transformed into the walls of a magnificent clubhouse, complete with hidden treasures of gold and candy. There are even special living quarters for the cats, Maurice and Buddy. Fleming’s words carry a youthful wit and charm, which she said she derived from conversations with Adrian. But as much as Fleming’s words came alive on the page, she says her book would not have been the same without the help of her best friend, Betsy Gerdes. Gerdes adds another element of magic to Fleming’s story through her art of pen, ink, and watercolor. Gerdes remembers spending hours at the library as a child, poring over the children’s books and admiring the illustrations. The soft hashes of the pen and the delicate touches of color open doors into other worlds for the main character, Adrian. Readers can really enter the story with Adrian and his cats through the pictures alone. This, the pair’s first entry into publishing, will not be their last. The two giggled together as they recounted how much fun they had throughout this process and were giddy as they uncovered small bits and pieces of their next venture. Their second book will tell the story of a girl who hates to go to sleep at night and the adventures that await her in the night. Together, the two hope to create stories that will be enjoyed in years to come. Magic in the Leaves is available at The Local Store, 205 N. Dewey St., Eau Claire, and through the author’s website at magicintheleaves.com.